I've just stumbled across Intentional Chocolate . 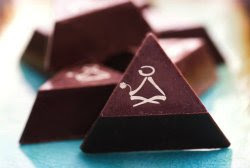 It's a concept that's even better than the idea that dark chocolate is beneficial to your health (an idea that certainly made me feel less guilty about my chocolate habit).Intentional chocolates are even better than dark chocolate. They are infused with good vibes from advanced meditators who focus on them as part of the production process with good vibes being part of the recipe. According to scientific research, chocolates infused with good intentions produce good feelings in 67% of those who eat them. I certainly think it is possible as I truly believe that on some inexplicable level, everything is connected. Hello chocolate. Bye bye Zoloft. I never knew that chocolate could bring peace and contentment on a cosmic level but now that I do, I'm definitely into it. Take a look at the video below and see what you think. Good post. I guess it was only a matter of time before chocolate was raised to deification. What a marketing campaign! It's like the films Chocolat and Like Water for Chocolate! I hope you've seen them, if you haven't you're in for a real treat. Well this all is good news for me, Dave is adamant about all emotions being perfect while he's making chocolates and will literally throw a batch away. Hi Guys--I haven't tried these yet, but the idea certainly tempts me and better yet, I can order them on the internet soooooo I just may and yes Frieda I have seen both Chocolat and Like Water for Chocolate and loved both films--although I found them both "bettersweet" chocolate. I wonder what percentage of people get good feelings from eating chocolate not infused with good vibes? If it keeps me out of my dark place...I'm in!! !